want to miss! Get ready to enjoy the 34th Annual International Jet Sports Boating Association (IJSBA) World Finals, going on now through October 11th. 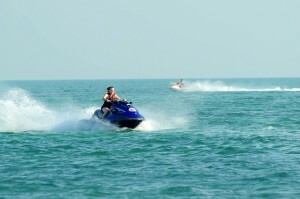 IJSBA is the most respected and impressive single personal watercraft event in the world. This special sporting event is invitation-only and attracts over 750 of the world’s top personal watercraft racers, the World Finals have been the foundation of IJSBA racing. Racers from around the globe make the journey to Lake Havasu every October for the prospect to compete for the world champion title on the international stage. There will be many food vendors to enjoy! Arrive early to get a good seat in the bleachers. Check the IJSBA website for the event schedule. Many vendors and plentiful beer stands. Come early to get a good spot in the bleachers! In addition to the World Finals, the cutting-edge and creative free-style action of the Pro Freestyle Expo will take place on Saturday, October 10, in the Bridgewater Channel under the London Bridge. As part of the growing competition in the freestyle and slalom classifications, chosen contenders will compete in this special event in the Channel. You won’t want to miss the action! Plenty of free parking is available in and around the London Bridge, at the English Village, and in the parking areas on the island near the Channel.